Top: Rendering of Apple’s new headquarters in Cupertino, CA. Bottom: Model of Columbus Circle Shopping Center in NYC by former NCSU architecture professor Matthew Nowicki. Bottom image courtesy of and copyright NCSU SCRC. The announcement of Apple’s new campus in Cupertino, California created a bit of buzz amongst the company’s fans as well as architecture enthusiasts. The design has been likened by many to a spaceship. It will feature several technological innovations as well as provide its own power from an on-site natural gas plant. While many were focusing on how new and different this building is, I couldn’t help but think how similar it is to the Columbus Circle Shopping Center Proposal (unbuilt), drawn up more than 60 years ago by the former head of NCSU’s architecture program, Matthew Nowicki. Matthew Nowicki put Raleigh on the architectural map with the construction of Dorton Arena in 1952, the first building with a roof supported by cables. In 1957, the American Institute of Architects declared it one of the 10 20th-century buildings most expected to influence the future of American architecture. 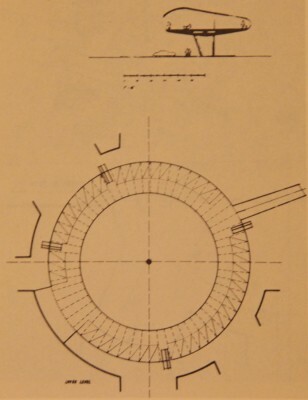 Nowicki’s dictum that the client makes an important contribution to the building and deserves part of the credit stemmed from his profound respect of ordinary men and their ways […] Even in the conservative South, long hypnotized by the classic-genteel position, his daring plans for the arena and grandstand for the State Fair buildings in Raleigh met with enthusiastic response from people who, although architecturally unsophisticated, could nevertheless appreciate the quality of man they were dealing with. This sense of specific human occasion is what gives Nowicki’s designs a variety unmatched by anyone this side of Frank Lloyd Wright. He was the head of the new architecture program at State College in the late 1940s until his tragic death in a plane crash in 1950. 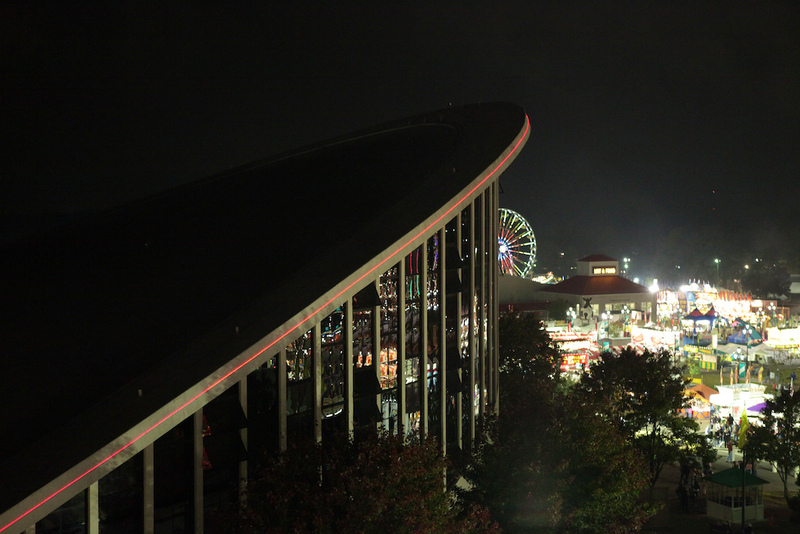 The Dorton Arena roof is two opposing parabolas, and not really a spaceship. The Columbus Circle proposal for New York City bordering Central Park more closely resembles a flying saucer. The shopping center proposal and Apple’s proposed new campus have a lot of similar features. The unique outward footprint allows for a large number of people to occupy it without rising too high above ground level, as well as providing several entry/exit points and views of the outside. People are the focus of the area, with cars relegated to below the people-occupied area. 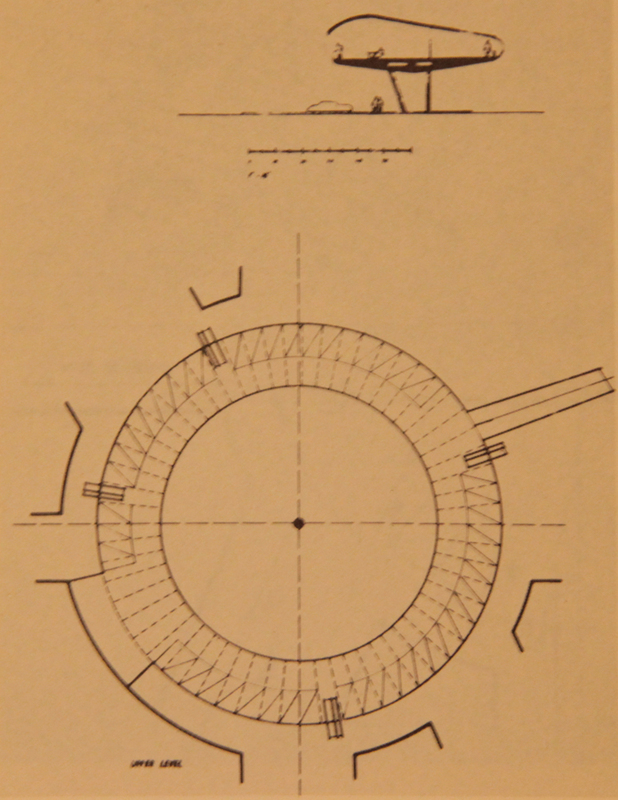 The 60+ year old Columbus Circle proposal was to be a building with the technology of the day: poured concrete. 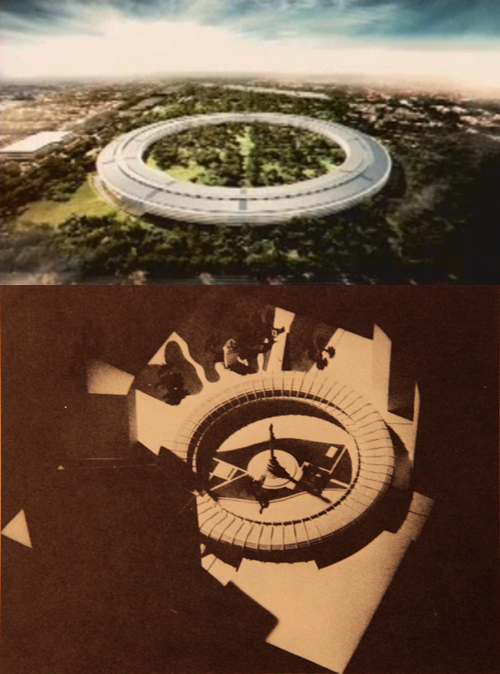 Nowicki had a strong desire to connect people with their outside environment, so I’d like to think he would have made a similar design decision as the new Apple building (expansive curved glass walls) if the technology available then would have allowed it. The biggest difference between the sets of plans is the technology which now exists: complex exterior glass forms. According to Mr. Jobs, “there won’t be a straight piece of glass” on the building. Considering that many of the iPhone 5 rumors involve curved glass, it’s interesting to see new manufacturing methods being exercised on a micro as well as macro scale. Jobs cited lessons learned in utilizing large amounts of glass in construction of retail Apple stores as influencing he the unique exterior. It’s not important whether or not this building received inspiration from Nowicki’s published plans. 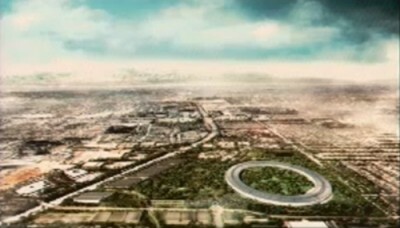 What matters is that something so similar to his vision will be built. 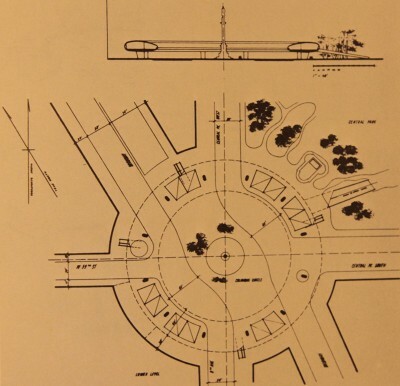 So many of Nowicki’s plans never moved beyond sketches, and it’s great to see that his project for New York City drawn up here in Raleigh was far ahead of its time. 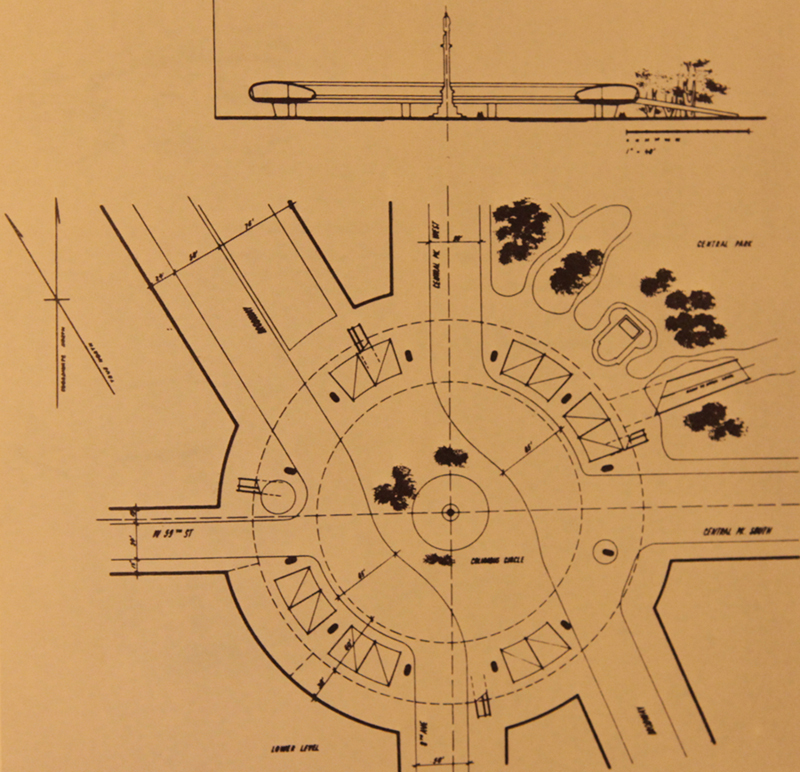 The NCSU Special Collections Research Center has a large collection of Nowicki’s drawings, plans, writings, and photos. The images used in this article are copyright of the NCSU SCRC and not for reproduction, but they are also available in the book, The Writings and Sketches of Matthew Nowicki. This book is available in the NCSU College of Design Library. Great, it’s time. The old campus lasted 20 + years. Now it’s time to get everyone together again. Imagine the possibilities then. Thanks Steve and Apple for 27 years of Mac. It’s been a great run. Wouldn’t be the first time to embrace someone elses vision and make it his own.